For fans of the high-hitting player Albert Pujols, 2012 was a frustrating year. 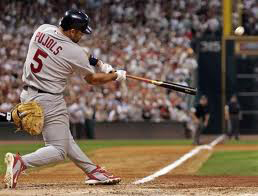 Pujols had just left a very lucrative career with the St. Louis Cardinals where he dominated the team and helped lead them routinely into the post-season and to World Series Championships. He was also adored and beloved by the St. Louis community, which made his trade to the Los Angeles Angels of Anaheim even more heartbreaking for some, sending shockwaves among baseball fans throughout the Midwest. pressure to perform among Angels fans was high, and rested heavily on Pujols’ shoulders. At the same time, he was still being vilified by some back in St. Louis for leaving just because of money. Whether or not that really weighed on his mind and affected his bat, is unclear, as Pujols is notoriously private, but things certainly started slow for him. Despite this, his stats from the past were impressive. Pujols has 475 home runs and it seems inevitable that he will eventually join the 500-home run club. He has an overall batting average of .325. He also has 2,227 hits and 497 doubles. He has 1,425 RBI and an on-base percentage of 1.025. Those are impressive numbers, but things did not start out well for Pujols in 2012. Perhaps it was just that expectations among the fans and players of the Los Angeles Angels of Anaheim and there was no way he was going to live up to those expectations. However, it seemed like everyone who was not a fan of the Angels was snickering and gloating as Pujols started the 2012 season and immediately began to struggle. However, for the 2012 season Pujols batted .217 and had no homers, but four RBIs, throughout the month of April. Pujols silenced his critics on May 6, in a game against the Toronto Blue Jays, when he knocked one into the stands for his first homer of the season that also brought home two runners to win the game. That broke the dam that Pujols had erected in his mind and ended the longest home run drought of his career at 139 at-bats. FHe finished the rest of the season strong, returning to form, it seemed, like he was when he wore the Cardinals uniform and the ball suddenly seemed to be throwing itself over the outfield wall rather than meeting Pujols’ bat. With that kind of finish to the season, fans could be expected to predict great thing for Pujols. He has not reported any off-season injuries. He has not had to go in for surgery. There seems to be nothing in the way for Pujols as fans look forward to the 2013 season. Given how strongly he finished things, it seems as if any mental blocks that might have been there when the 2012 season started are long gone. The only thing that seems to be standing in the way of Albert Pujols having a fantastic 2013 season is whatever is going on inside Albert Pujols’ head.